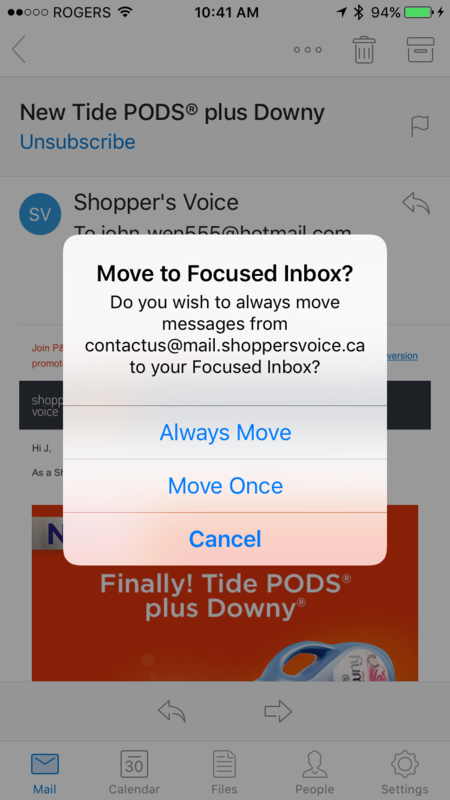 Select and click on Always move to Focused inbox. Tip: Check the Other tab from time to time to make sure you don’t miss any other important emails. 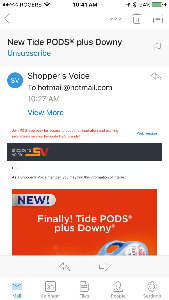 Go to Other inbox and open an email such as from Shopper’s Voice. Go to the Other tab. 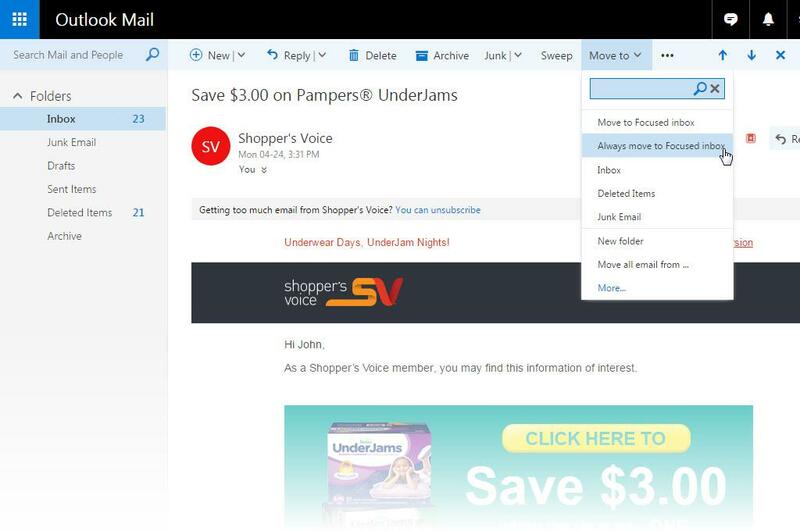 Open an email from the sender such as Shoppers Voice. 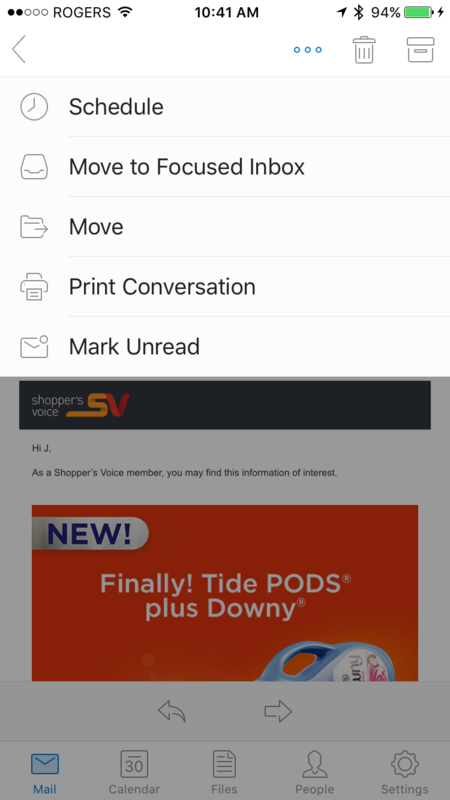 Tap the overflow icon (three dots icon), and select Move to Focused Inbox. 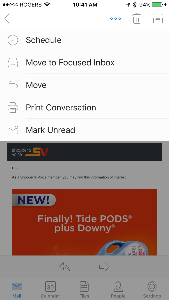 Tip: Check the Other tab from time to time to make sure you dont miss any other important emails. 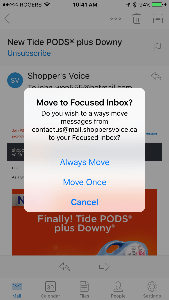 To learn how to turn off the Focused inbox in the mobile app, click here: https://support.office.com/en-us/article/Turn-off-Focused-Inbox-f714d94d-9e63-4217-9ccb-6cb2986aa1b2 We hope this helps you get your emails sorted the way you like it. Looking fwd to learning more about this! Hope to be lucky and win. This was the longest survey I’ve ever done—way too long. I almost gave up. The survey asks too many personal questions. I thought this was for Giant Tiger not Shopper;s Voice? I agree it is definitely the longest survey I’ve ever done for a store. I kept dozing off to sleep but I do like giving feedback you’re right about them asking too many personal questions. I don’t mind because it could help others. I know I feel completely hopeless after suffering for over half my life so almost 26 years and can use any help if I haven’t tried something and I’m on disability so I can’t afford most things like my supplements and singular isn’t cover or lyrica and I can’t afford them. I so desperately need help. Shoppers is my favourite store but I always spend too much on necessities let alone a few things for myself but that won’t happen. Bibi Ally. Love to do survay. Looking foward to win some thing. I loved doing this survey it really made me think lol but it was great hopefully I will be a lucky contestant. I am thinking the same way, hopefully I wish I can be the winner. I find some surveys ask too many other questions about the make of car etc. One thing I am afraid off is that this will put a lot of Retail stores out of business. This should be very convenient way of future shopping. to make sure I have been added and am able to take part in the contest. Too bad it can’t be done in 2 parts or be paused to finish later. i am writing to thank you for your time and good idea about shoppers. To make sure I’ve been added and to take part in the contest. I was thinking that it could be done in 2 parts or have a way to pause it and complere later! Please make sure that I am included in sweepstake draw and certainly advise me if I win!! hoping to see more surveys and to receive samples in the mail. Survey was very long ! Just so you know, we’re not associated with Shoppers Drug Mart. I hope to get some free coupons. Glad to do the survey. Love to shop. I look forward to receiving samples and coupons.Also other surveys that I am eligible to do. I didn’t mind doing the survey. chance at winning the sweepstake. Thank you! Hoping to receive samples, coupons and contest. A very comprehensive consumer survey! Advantage for consumer…it gives an over-view of their own shopping habits!!! Looking forward to samples and hearing from you. I’ve never done this before but it seems to be a good idea to fill it out and get samples of products that are new on the market. It’s a very detailed servery. I hope that everyone that participated in this, got a chance to win a prize. SurveyOK hope I could help! What is this survey intended to do? thank You I enjoyed doing the survey. Looking forward to receiving free samples and winning money. I don’t like doing surveys unless my points or offers really mean something not a bunch of maybe’s If thers’s a regualar guaranteed dollar amount I’d do survey’s for a job. To make sure I receive my messages. It was way to long, I like doing surveys hope I win. Looking forward to the mail in coupons thank you. I HOPE WE RECEIVE SOME CASH! MONEY WOULD BE VERY MUCH APPRECIATED IN OUR HOME! Lengthy survey but, got through it o.k. Thanx! This is a long survey. I hope it is worth my time. LONG BUT INTERESTING SURVEY . interesting taking the survey. i loved it. 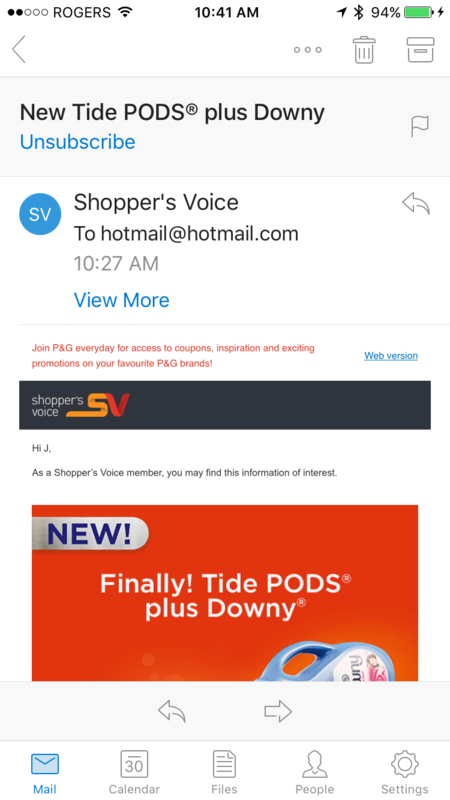 Looking forward to checking out shoppers voice. I sure wish I could get some help getting outlook and live email on my tablet, but every time I try is fails. Survey was interesting with unexpected questions. what free is the free stuff that I will receive for the great amount of work that it took to fill out the questioner? I just loved the survey, it covered lots of things and I really liked t. Gfeat survey!! Thank u hope I win never won any thing in my life. It was a good survey, but a bit long I hope this can help for a great development. Good way to know what the people like and what they need more . Yes, the survey was long – but interesting. The majority of questions related to average families – also to those of us retired. Interesting survey. Would like to receive samples and products I haven’t tried before. didn’t think I was going to finish, very long. I am just proud to be part of the online survey team forwarding views and ideas regarding individuals and family daily usages and requirements. I like free stuff and surveys so this is perfect. Interesting survey and makes me think about all the things we use and take for granted. Thank you. Thanks very informal but I enjoyed it and it made me think of how we live an spend our money over the year. I didn’t mind doing the survey in fact I enjoyed it, house was quiet and no phones so all ok. Would love to win as I am a senior it would be nice, but even if I didn’t would still love to fill out surveys, thank you ! Samples in the mail box and coupons! Very long survey. Hope to win something. we shop walmart weekly don’t know what to say? This survay was very good and complete. What can I say I like surveys and rewards and paid surveys are nice too. Thanks for the opportunity to do the survey. Looking forward to free samples and prizes. i enjoy doing the survey, hoping to receiving some coupons or freebies by mail, . Thank you. Hope this was all worth the time it took. Nice to know you appreciate what your customers have to say. I would like to add that Lori Ann was very knowledgeable and helpful in advising me when making my purchase. It means a lot to have someone take the time to explain values of products. it certainly made my shopping experience a pleasant one! Thank you Lori and Shoppers! This is the third time I’m back here. Like to see more surveys, and free goodies. I just loved doing this survey. I enjoyed doing this Survey. It was fairly long but kept my interest all the way through. Thanks for allowing us to share our family activities at home. hope to win contest, offers, coupons. thanks for treating me so well. Some questions are they pertinent for this particular survey? I look forward to receiving samples & coupons and hopefully more surveys that I am eligible to do. Thank you. Pretty straight forward and I really didn’t mind the time. I look forward to receiving coupons. This is a very long survey. I agree with some of the other people, the survey was way too long and you ask a lot of personal questions. Hope this survey will be useful to you. I answered as best I could. Thank you. Sure was a long survey. Hope I win something for this. I do like coupons. Way too long and too personal. Hope I win before my cancer kills me good luck and God blesses alll. I’m very leery about getting “FREE” samples. I’ve been burned several times. When you get the “Free” sample the next shipment aarrives in a few days and these outrageous charges appear on your credit card. I have never found a product obtained this way that works. We are both recently retired and a win would be nice. May it help everyone involved. Covered many issues related to shopping. I look forward to receiving new samples/coupons etc. based on my replies. I hope the survey is useful to you and Thank You for the airmiles. Are you wasting food? Here’s how to avoid it. Is your car ready for winter? Tech spotlight: What’s in store for 2018? Shopper's Voice. Coupons. Samples. Free Stuff. Whoa!